Hi guys! 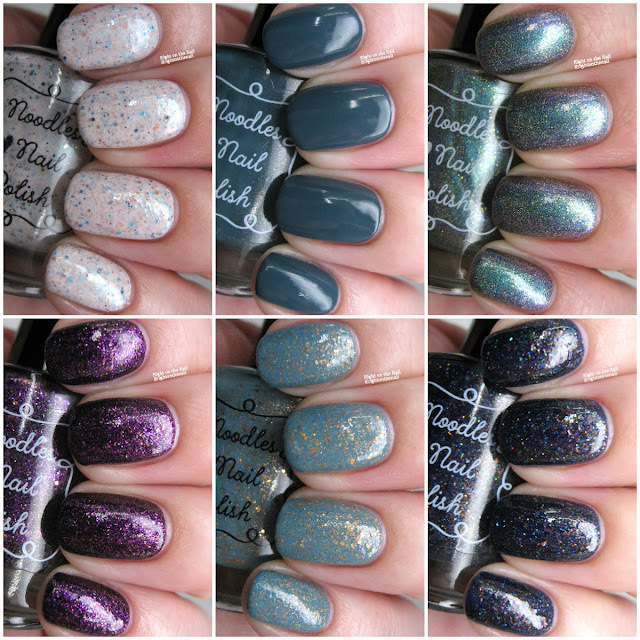 Tonight I have 2 collections from Noodles Nail Polish that are being released this Friday, January 2nd at 6 PM EST. I had the chance to try one of Natalie's polishes a few months back when she was the guest spot in the For the Love of Polish box. I don't think I reviewed it here on the blog, but that's just because the polish was exclusive to the box and no longer available. When I was asked if I was interested in reviewing more polishes, of course I jumped at the chance. The first collection is a 6-piece winter set, while the second is a Valentine's Day trio. These will be available individually, or as a 9-piece set with special pricing ($80). All polishes except for Bundled Up (the holo one-$10) will retail for $9.50 apiece. This is a long post with lots of pictures, so let's settle in. Oh, and a congratulations is in order for Noodles Nail Polish because they were voted the #3 top brand for crelly polishes from the Indie Swatch Awards. TL;DR I love these polishes. Did I mention that Natalie is the queen of the crelly polish? It's no surprise that we're starting off with a white crelly base with small to medium blue, copper, gold, and navy glitter. It's hard to see from the photos, but it also has a gorgeous turquoise shimmer in the background. Since Natalie is known for crellies, I'm happy to report that all crelly polishes had a perfect formula. It wasn't thick and goopy, and you're able to get smooth, thin coats. I used 3 of these thinner coats for my photos, but you may get away with 2 if you're heavy-handed. It dries with some texture, so make sure to use a thick topcoat to smooth it all out. With all of the glitter, you'll need to use a little extra elbow grease, or if you're like me, get out that peel-off basecoat to make things easier. To switch things up, we have Below Zero which is a medium dusty blue creme that leans slightly teal. This one is extremely pigmented and is a 1-coater. Sure, I used 2 for the pictures, but that's just because macro photography is so unforgiving. For all of you nail artists, I was able to use this to stamp, but I'm going to do everyone a favor and not show it. Trust me, it stamps. The formula was a bit thinner than the others, but it didn't cause me any problems. Just make sure to remove all excess polish from the brush before applying. Despite being so pigmented, I had no issues with staining of the nails or cuticles. Oh.My.Goodness. Bundled Up is everything. It's a multichrome that shifts from green/purple/blue/red with silver and gold holo flakes and a scattered holographic finish. There's a lot going on with this one, and there's just the right amount of flakes to make this completely unique to me. I used 2 coats for the photos, and the formula was just perfect. It dries with no texture, even with the flakes added. Cold Hands, Warm Hearts is an amethyst purple jelly base with a lots of gold flakes and purple shimmer. Despite being a jelly, I was able to get away with 2 coats. The flakes added so much depth to this polish and I love it. It dries with a little texture, so make sure to use a thicker topcoat. The formula and application were flawless. Is it possible to have a polish I love more than Bundled Up? I was instantly drawn to Moon Glow, likely because it slightly resembles the color combination of Barielle's Falling Star. Barielle's only has 1 size of copper glitter, while Moon Glow has different sizes with gold thrown in there for good measure. Moon Glow is a dusty blue crelly base with copper/gold microglitter and copper shimmer. I used 2 thicker coats for full opacity, but you may need 3 if you have a light hand. It dries with a bit of texture, so keep that thick topcoat, and peel-off basecoat handy. Last, but certain not least we have Winter Solstice which is a deep navy jelly base with iridescent microglitter and rainbow flakes and copper shimmer. I love flakies! I used 2 coats for full coverage, and the formula was a tiny bit thicker than some of the others. This was by no means problematic, you just have to have a thicker base to keep those flakes and glitter suspended. It dried with some texture, so see the previous suggestions. Loveable has pink, purple, and silver holographic shreds and microglitter in a scattered holographic finish. This one looks more textured than it feels in real life, so don't worry about it being too rough. Bust out that thick topcoat to smooth it all out. This is a full coverage glitter polish, so I needed just 2 coats here. Removal is tough, so I recommend using the foil method or a peel-off basecoat here. For you seasoned Noodles Nail Polish fanatics, you may recognize Mint For Each Other and Strawberries and Cream. They are reformulated throwbacks, so don't expect them to be exact duplicates from years past. Unfortunately I don't have the old polishes to compare, but you may be able to do a little Googling to see some older pics. Mint For Each Other is a white crelly base with mint green, pink, and magenta glitters and small pink hearts. I recommend turning this bottled upside down about 30 minutes before applying to make those hearts easier to apply. By doing this I didn't have to do any fishing for glitters. The first coat was a little streaky, but it built up nicely in 3 thin coats. This one also dries with some texture. Strawberries and Cream is another throwback shade and is a creamy light yellow crelly base with red, pink and gold hexagonal glitters. It's slightly less yellow in real life...I think my skin brought out the yellow tones. I think this one is so unique and Valentine's Day appropriate without being a straight red or pink polish. I found the formula and application to be exactly the same as Mint For Each Other. Overall, I love these collections for several reasons. 1. It has something for everyone. 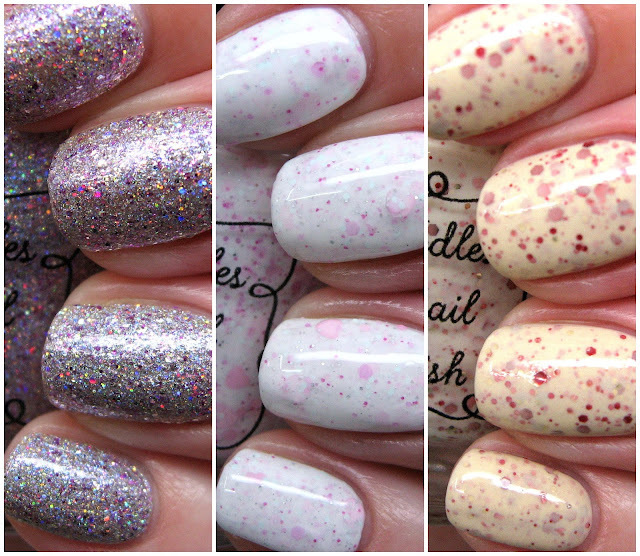 Natalie gave us a creme, a couple flakies, a holo/multichrome, several crellies, and a microglitter. 2. It has unique color combinations. This shows me I need more blue and copper polishes in my life. 3. Natalie is the queen of the crelly. If you must make me choose some top picks, I'd have to go with Moon Glow, Bundled Up, Arctic Freeze, and Loveable. If you're like me, you'll want to just buy the whole bundle for $80. These will be available this Friday at 6 PM EST on the website. You can find out more about Noodles Nail Polish on their website, Instagram page, Facebook page, and Facebook Fan Group.